When my kids were younger, and even now sometimes, they loved to sit on the floor. I couldn’t get them to sit on the furniture at all. Back then, I really wish I knew what I know now about giant floor pillows. 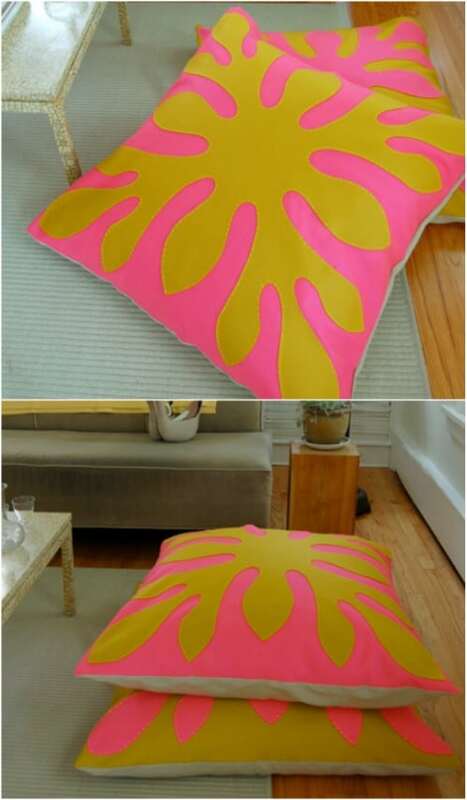 Did you know how easy these cushions are to make? I started looking recently at some giant floor pillows and could not believe how simple the concept is. 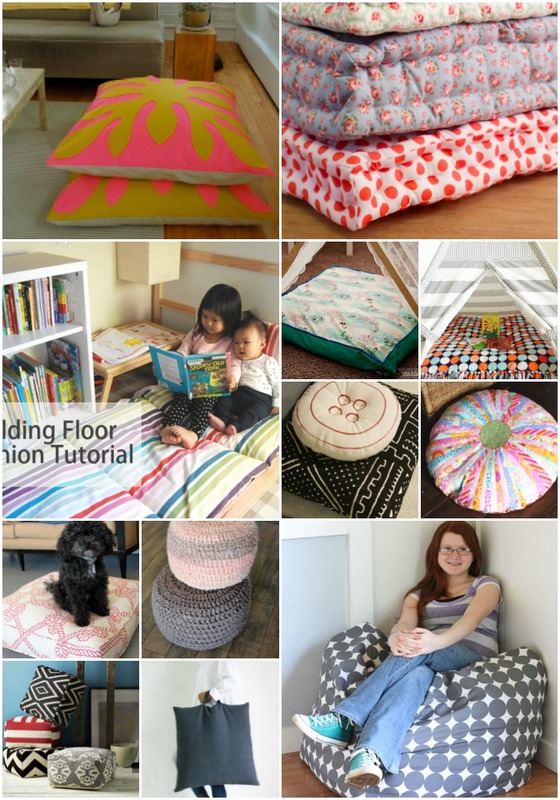 So, I gathered up 22 easy DIY giant floor pillows to share with you. If your little ones, or you, love sitting on the floor, these cushions are going to make it much more comfortable. These are especially great for extra seating when you have company over and they are perfect for teenagers’ rooms or dorm rooms. They are all so simple to DIY. You can have one finished in just an hour or so, depending on your style and how you want to make it. From crocheted to sewn and even a great no sew option, there is definitely a giant floor pillow in here that you need in your life. And, if you really love sewing, you need to check out these 30 top DIY sewing projects for summer. They’re all so easy and perfect for the warm weather season. I love anything that makes my life easier and a giant floor pillow would be so great. Imagine having these outdoors for summer relaxation and entertaining. You will never have to worry about extra seating again. 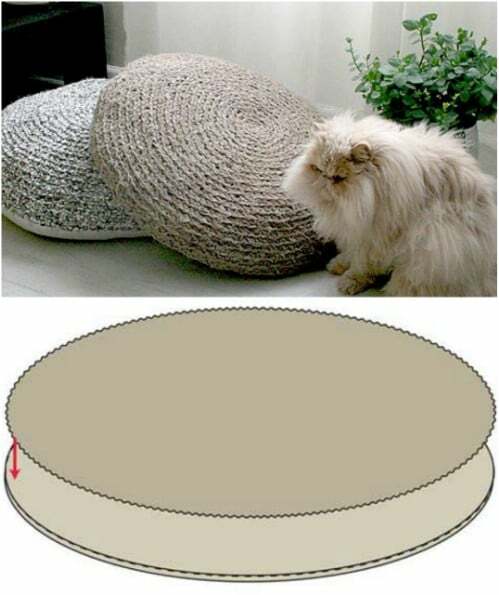 They also make wonderful pet beds and are so decorative that you won’t mind leaving them right there in the living room. Whether you want something for yourself, your kids or your favorite furry family member, you are definitely going to love these DIY floor cushions. And, be sure to check out these 30 easy DIY accent pillows that can accompany those floor cushions. A couple of old sheets and a crochet needle are all you need to create the huge rag pillows. These are perfect for extra seating on the floor or for your pets. 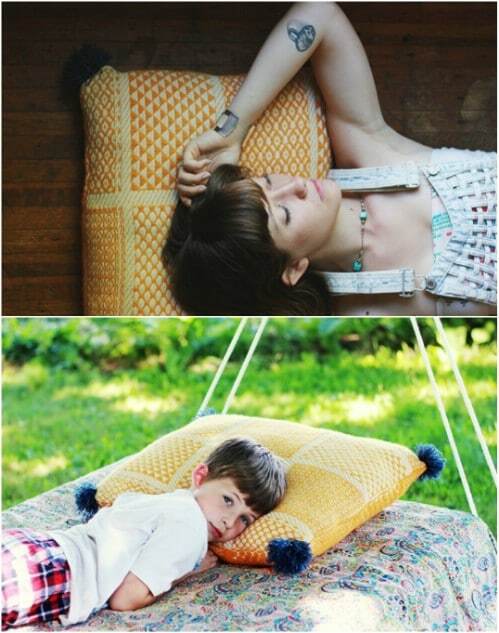 You just cut your sheets into strips and then crochet them into these amazing floor pillows. And, you don’t need to be an expert in crochet to do these – they’re really simple! You have to love free crochet patterns! 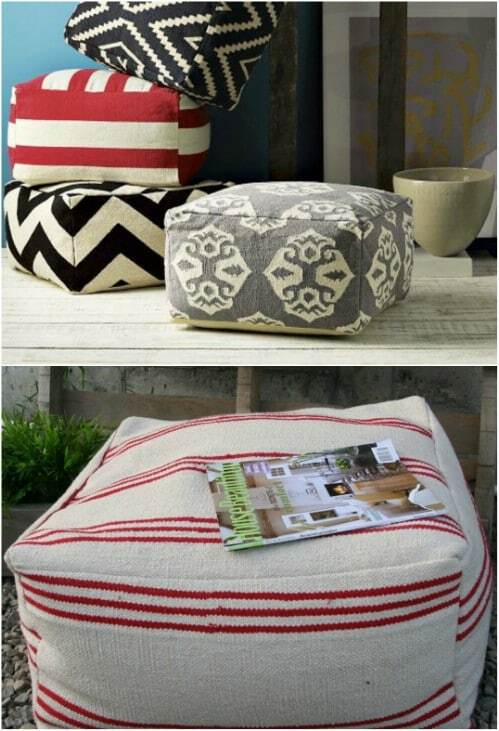 These floor cushions can be made from repurposed fabric. This is a great project if you need ideas for using up scrap material. This is an easy cushion to make and it’s huge when it’s finished, depending of course on just how big you want to make it. This is a sewing project but it’s a really simple one and you can customize exactly how it looks by choosing different fabrics. 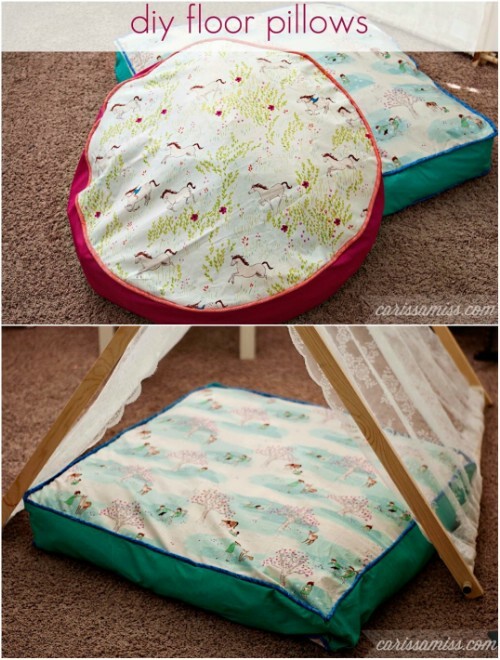 Little ones will absolutely love this DIY kid sized floor cushion. They can use these in their bedrooms or in the living room or family room. 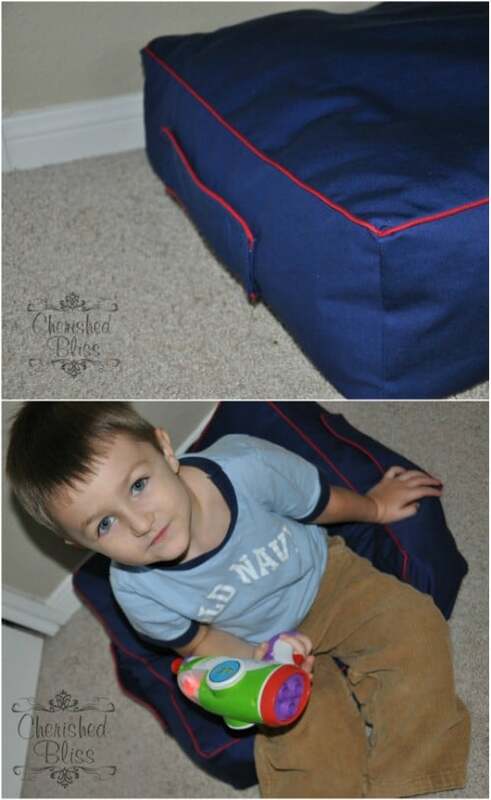 Experience tells me that kids would much rather sit in the floor than on the furniture, so these easy DIY cushions are perfect for that. You can even make them with stain proof fabric or something that has an indoor outdoor quality to keep stains to a minimum. Turn that scrap fabric, or an old sheet or a yard of fabric, into an adorable little button pillow. This one is rather small but you could easily adjust the fabric to make it large enough for a floor cushion. The pattern calls for three quarters of a yard of fabric, so just double that to make the cushion a bit larger and cut your pattern accordingly. This one is so easy and so adorable when it is finished. Turn a couple of skeins of yarn into these adorable crocheted floor cushions. These are pretty simple to make, even if you don’t crochet a lot or are just beginning. You can use these as footstools or as extra seating. They’re really tall so they are perfect for putting your feet up and relaxing, and you don’t need to know any fancy or complicated crochet stitches to make them. You can make a couple of cushions for your patio furniture and a matching floor cushion with just a couple of yards of outdoor fabric. These are really simple and they are perfect for relaxing out on the patio when the weather permits. 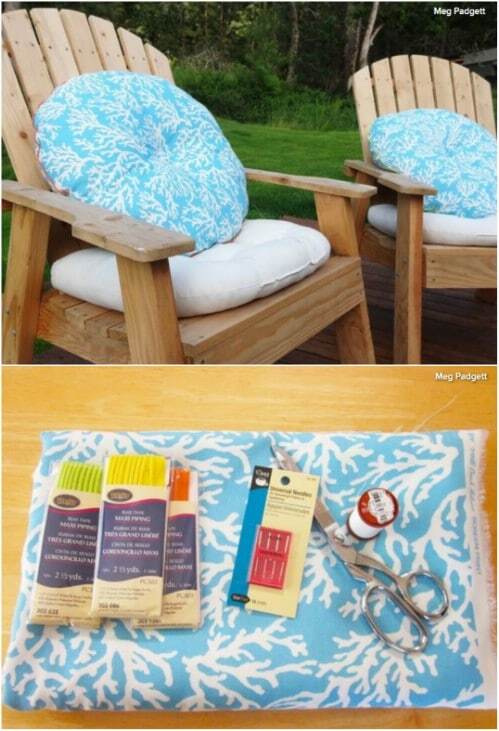 Plus, since you make them with outdoor fabric, there are no worries of weather or stains on your new cushions. How great would a floor cushion with a handle be? You can carry it wherever you want to take it. 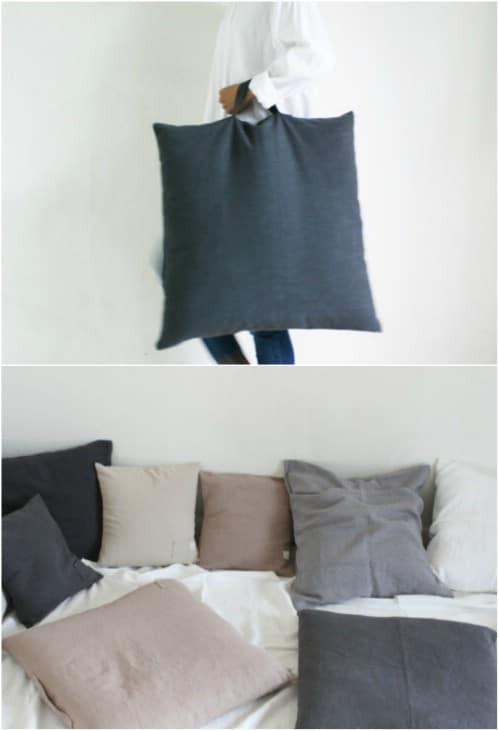 Imagine a soft cushion for your kids’ ballgames or even something that you can easily tote indoors and out. This one is so simple…you just add a handle to your square floor cushion. I found this one on Etsy for around $60, but you could easily DIY this one with a square cushion pattern and some extra fabric for the handle. 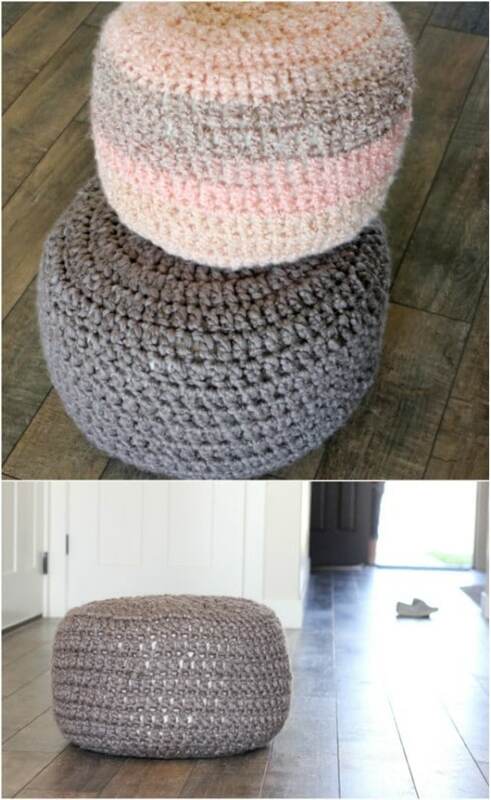 I love these huge floor poufs, and you can make this one for less than $10! You make it from an IKEA floor mat – well, three of them actually and they only cost around $3 each. It does require sewing but you don’t need to be a sewing expert by any means. 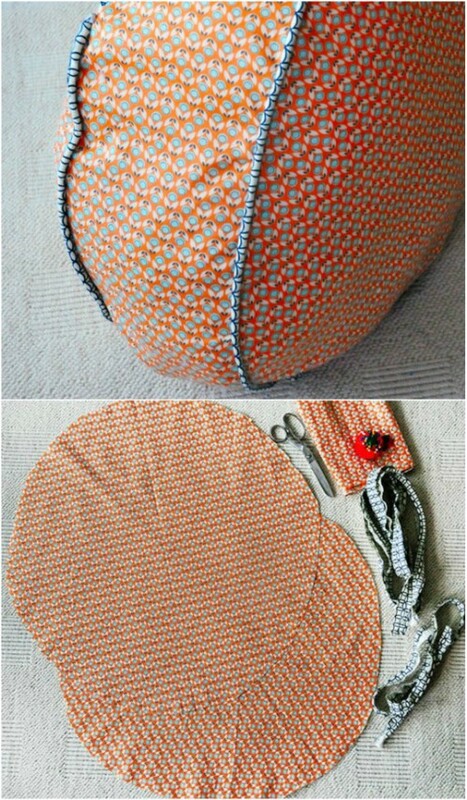 You can have this glorious floor pouf finished in just a few hours even if you hardly ever pick up a needle and thread. Don’t you just love a great IKEA hack? Here is a fabulously large folding floor cushion that is perfect for relaxing on the floor or even as an extra bed for sleepovers. This one is super simple to make and you only need about two yards of fabric to make it. When you aren’t using it, it folds up so that you can easily store it away wherever you have a little bit of closet space. Here’s a little tip – make it out of outdoor fabric and it’s perfect for laying outside and catching some sun! An old blanket can be easily repurposed to make a nice big floor cushion for relaxing or extra seating. You can use thick fabric for this, as well if you don’t have an old blanket to use or if you have some old thick curtains, you could also use those. This one is pretty simple and it’s really comfortable. You need a bit of sewing for this one, but nothing too complicated. This squared floor cushion is perfect as a pet bed or you could use it as seating when you have a house full of people. You could also do this one in an indoor outdoor fabric and make extra seating for on your patio or in the backyard. These are super easy to sew together and you can do them in any number of sizes, from large to gigantic! This giant Girard floor cushion is as fun as it is comfortable. You can make this one easily even if you don’t sew a lot in general. 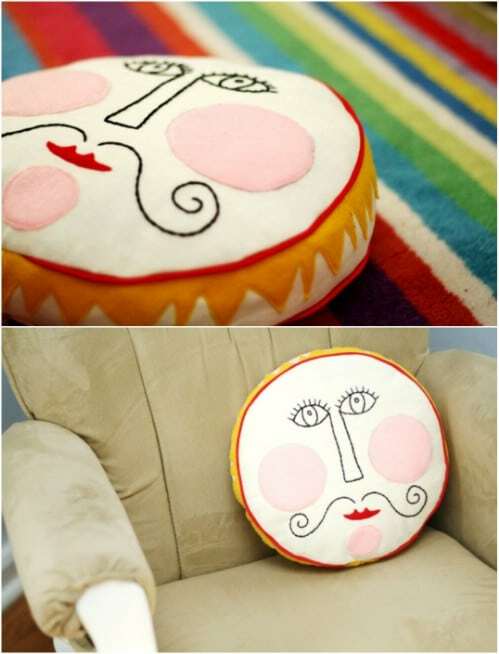 You use felt and black embroidery thread to create the whimsical face. Kids, teenagers especially, are going to love this one and it’s a really quick one to make, even with the customization. This would be a great gift for your graduate who is heading off to college – it’s a fun dorm room cushion! I love anything that has a tropical theme and you are going to adore these DIY Hawaiian themed floor pillows. They are made with felt, for the decoration, and you need a couple of yards of fabric to make the cushions. The design is really simple to do and it is perfect if you are looking to add some tropical flair to your home. I love DIY beach themed décor for indoors and out! 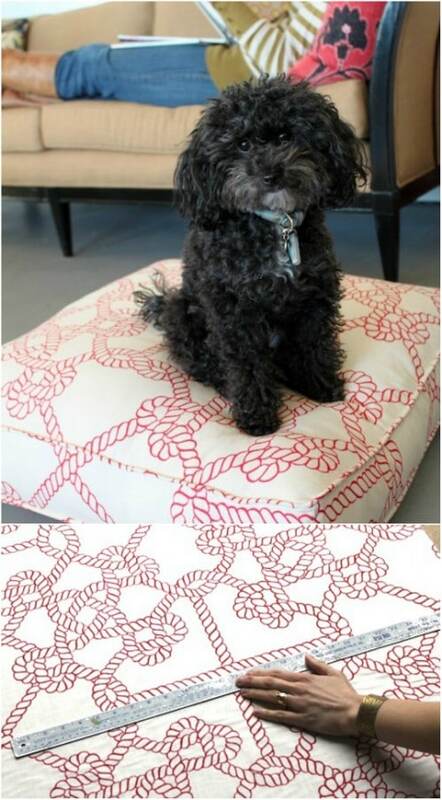 This super easy to sew DIY floor cushion is 18 inches around – although you could do it larger if you wanted. You just need enough fabric to cut out two circles of the same size – 18 inches or larger – and then the thread to sew them together. This one is so easy and you can hand sew it if you don’t have a sewing machine. You can have one of these made in about an hour or so. 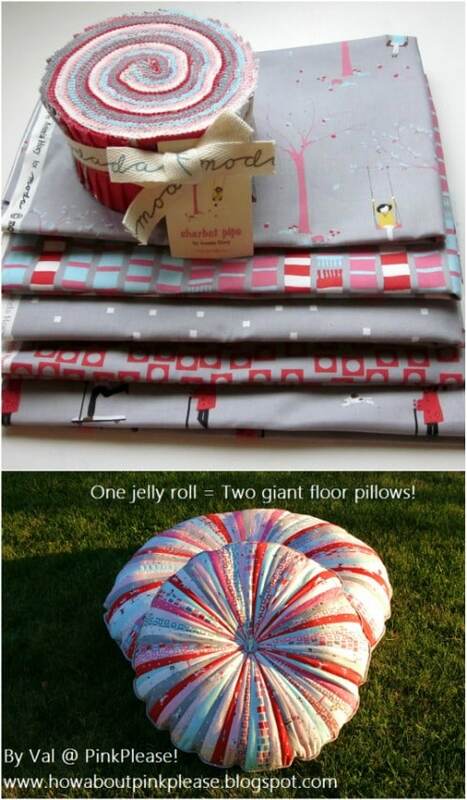 These DIY jelly roll pillows are perfect for living rooms, bedrooms or the patio. They are much easier to make than you may think and they are so much fun to look at. You need about three yards of fabric altogether, counting the pillow and the piping, and your basic sewing supplies. These are so easy – you can have one finished in about an hour or so and they are so fluffy and comfortable when you get them finished. This giant floor pouf is inspired by West Elm, but it’s a lot cheaper to make than to buy. These things will run you more than $100 if you buy them from West Elm but you can make one for under $20. You just need the fabric and the stuffing and a couple of hours to put it all together. This is huge when it’s finished – huge enough to act as a seat if you need extra seating. If you are looking for something that has a great traditional design, this patchwork floor cushion is perfect. You make this with different colors or designs of fabrics, so it’s a great one for using up leftover pieces from other projects. 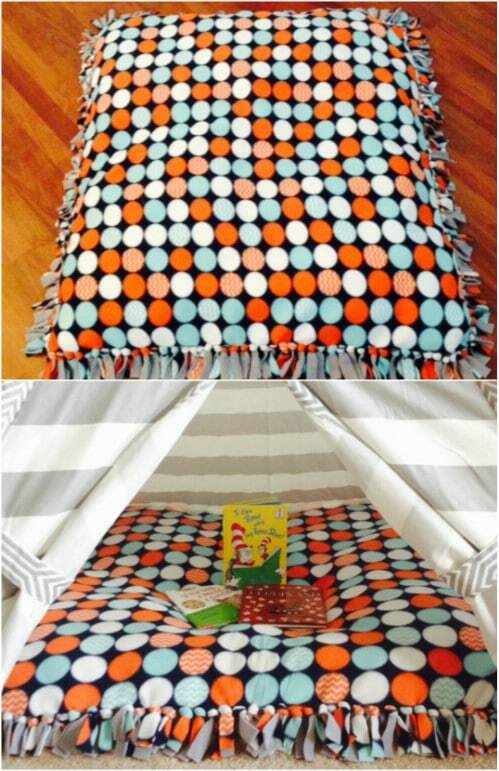 It’s a pretty easy one to sew together, too and it makes a huge square cushion that can act as a pet bed or as extra seating when you need it. This is a great one if you ideas to upcycle leftover fabric scraps. 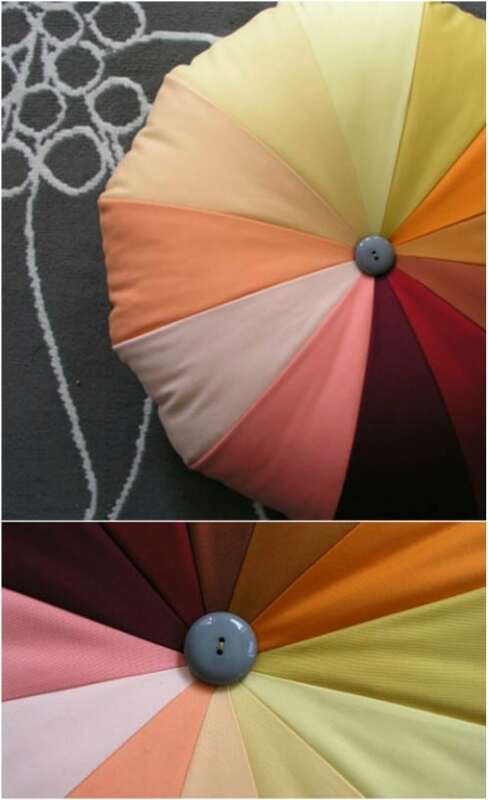 Here is a lovely patchwork pouf with rainbow colors that is perfect for adding some extra seating or for making your own footstool. You just need a collection of fabric in different colors or designs and a few other essentials. This is a rather large pouf, too so it’s great for adding to a teen’s room for additional seating for those sleepovers. I love how easy these DIY quilted floor cushions are to make. 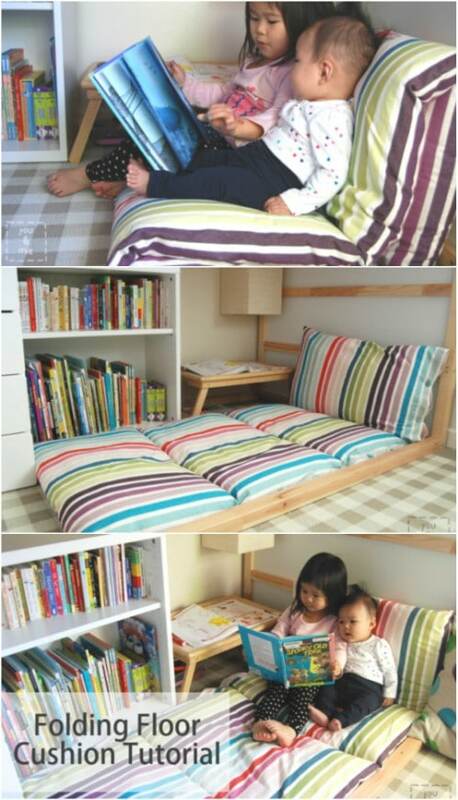 They are perfect as pet beds or additional seating for little ones on the floor. You could use them for such a relaxing nap, too! 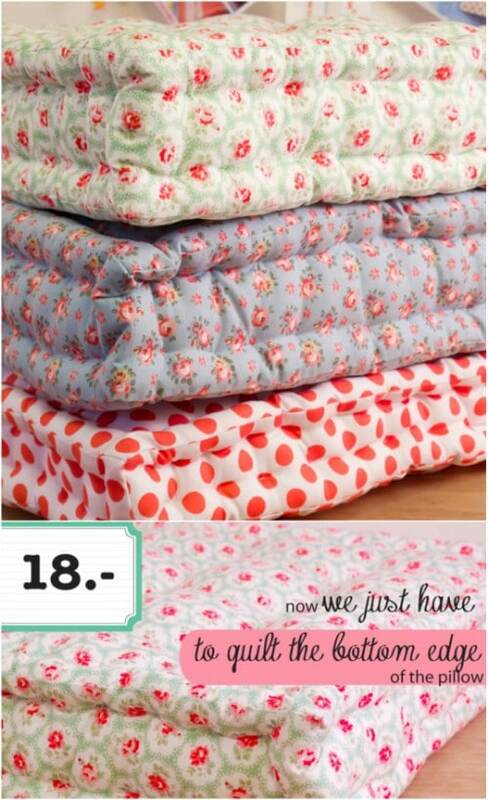 If you have never quilted before but have always wanted to try your hand at it, these are perfect for practice. 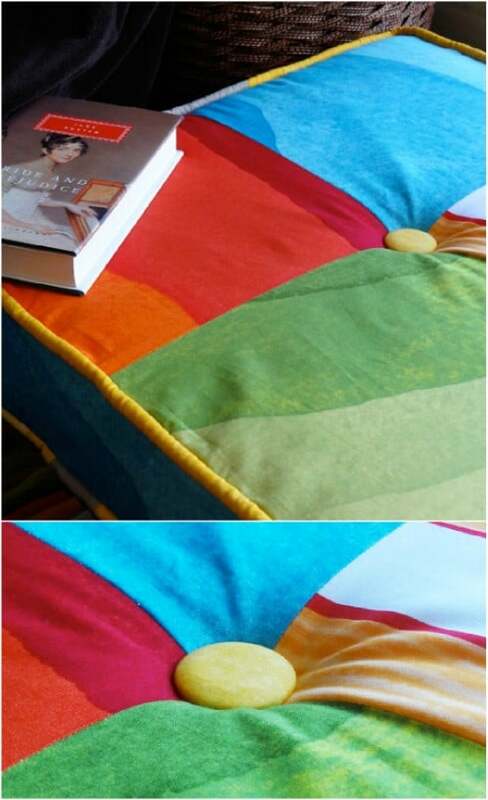 They are super easy to quilt and to sew and give you such comfortable floor cushions when you’re done. These extra large DIY floor cushions are super easy to make and you can knock one out in about an hour or so. These things are huge! You can use them for pet beds, footstools, seating or even for napping mats for your little ones. You just need a couple of yards of fabric for each cushion plus some matching or contrasting fabric to make the sides of the cushions, and you can do them in circles or squares. 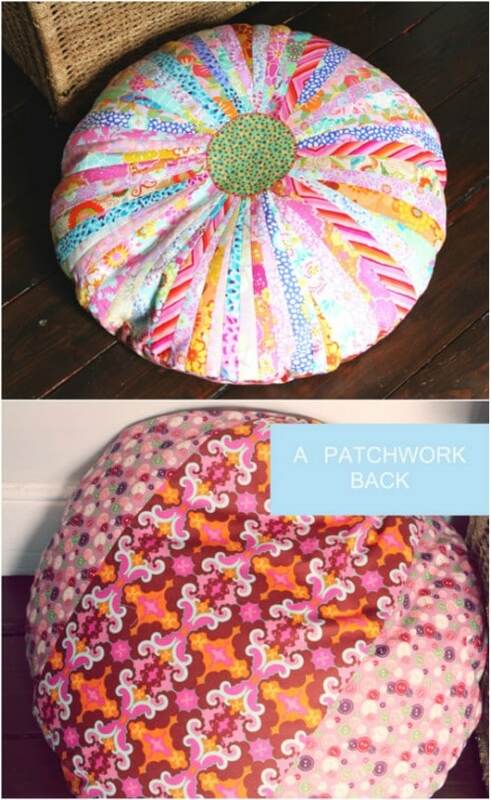 How do you turn a floor cushion into a great bohemian styled piece? You just add some fringes and other decorations. I love this bohemian styled pillow. It looks so gorgeous and comfortable at the same time. You could easily do this with a square pattern and the right material. Then you just have to add the embellishments that make it bohemian styled. Or, you could just check out this one that I found on Etsy for under $60. 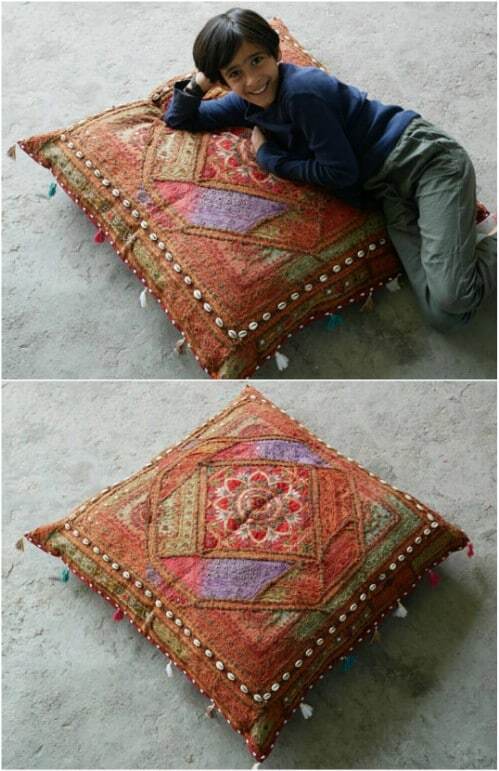 How about a super easy floor pillow that you don’t have to sew? This one is so easy and there is absolutely no sewing required. You can make this as large as you want and it’s just as easy no matter what size you do. You need some fleece fabric, or a couple of old fleece blankets and something to fill the pillow with. You hold it together by tying it and it’s a really simple process. You can finish off one of these in about an hour!